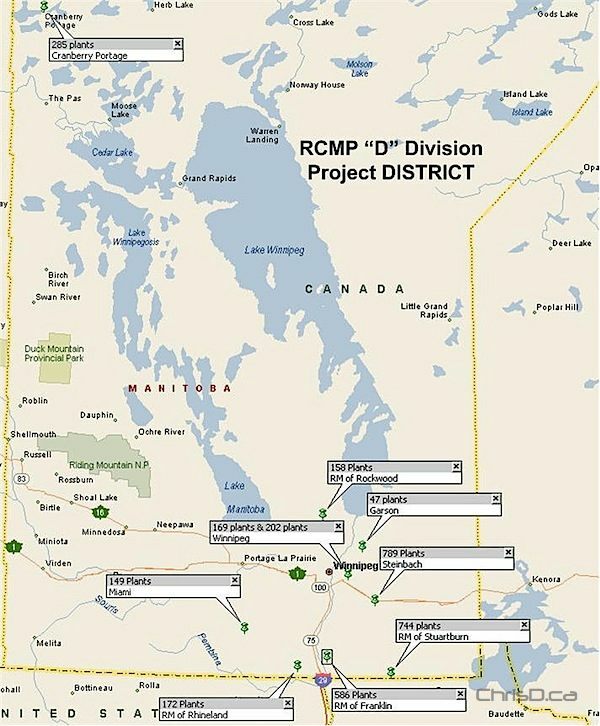 A five-week operation known as Project District has resulted in RCMP seizing a significant amount of marijuana from 10 grow-ops throughout Manitoba. The investigation resulted in the seizure of 3,300 marijuana plants, which would be enough to produce more than a million joints, say RCMP. Police also seized approximately $34,000 in cash and a large quantity of specialized equipment that is normally used by organized crime groups. Six of the 10 properties where the busts were made have been deemed unfit for human habitation until they have been inspected and repaired. Thirteen people face drug-related charges, theft of electricity and possession of proceeds of crime. Winnipeg police also announced their own grow-op bust on Friday, which occurred in the 600 block of Toronto Street. Officers seized 235 marijuana plants worth an estimated $263,200. A 57-year-old man is facing charges and was released on a promise to appear.